Sunday morning coffee was easy to find considering Zagreb is the city of cafes. The problem was finding one at 7am! Most cafes open at 7am on weekdays, but on weekends it’s 9am. We were ready by 7.30am ready to explore the city before any tourists come in. Heading out towards the main square at Trg Josip Bana Jelačića, we stopped over at one of the newspaper stands that advertised “T-Mobile Simpa” pre-paid cards. For HRK 50, you get a SIM card and unlimited texts with not-sure-how-much calling time; although you can make international calls too. Upon activating the SIM card, I immediately received a text message (in Croatian which was translated using Google Translate app for iPhone) saying browsing Facebook is free on the data network! Upon reaching the main square, you can hear all the hustle-bustle at the Dolac Market, where locals sell anything under the sun – mainly flowers, fruits, vegetable and a few stalls of souvenirs. Walking past the busy Dolac market, we reached Ivana Tkalčića where you can be assured to get an early coffee. Apart from all the varieties of coffees you will find in Croatia, there are two main which are our favorites – Coffee with milk and Bijela Kava (Cafe Latte). Each costing anything between HRK 10 – 30, our preferred choice was Bijela Kava. Realizing it was an early Sunday morning, we took our time sipping coffee and watching the locals buy and sell things at the Dolac Market. 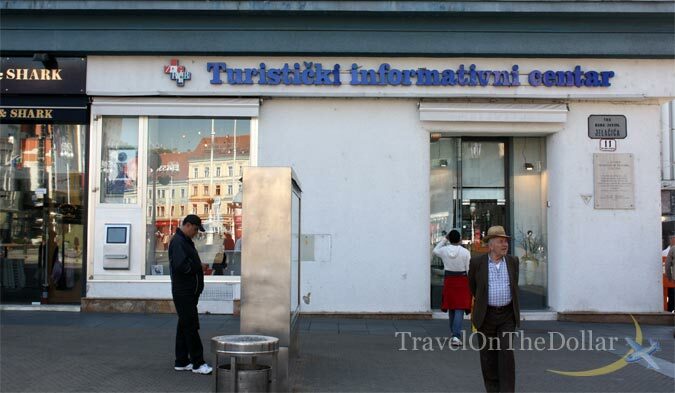 A lot of guidebooks recommend purchasing the Zagreb Card, so we headed over to the Tourist Information office at the main square (Trg bana Josip Jelačića 11; Tel: +385 1 48-14-051, +385 1 48-14-052; hours: Mon-Fri: 8.30am-8pm; Sat: 9am-6pm; Sun 10am-4pm). If you stand in front of the Josip Jelačića statue facing the main street (Illica), the TI is located on the left at the intersection of Trg bana J. Jelačića and Bakaćeva. One of the best thing to do in Croatia before you start on your tour is to visit their TIs. They have some amazing information and they speak English. The Zagreb Card comes for 24 hours (HRK 60) or 72 hours (HRK 90) and gives you unlimited access to all public transport (trams, trains, buses and funicular) and discounts to museums, restaurants and other activities. We noticed that no one swiped their tickets or cards on trams or buses on Sunday, so it may not be worth spending that money on the card. You may want to list down the prices of all the places you want to visit and the discounts you may get, and maybe it might not be worth buying the Zagreb Card. 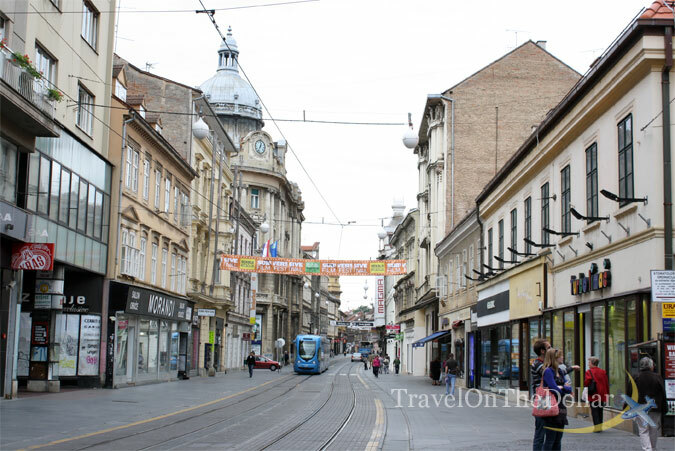 We started with our “Zagreb Walking Tour” which takes about 3 hours to finish. Note that some cathedrals, museums and places of interest may be either entirely closed or closing early on Sundays so plan your tour accordingly. 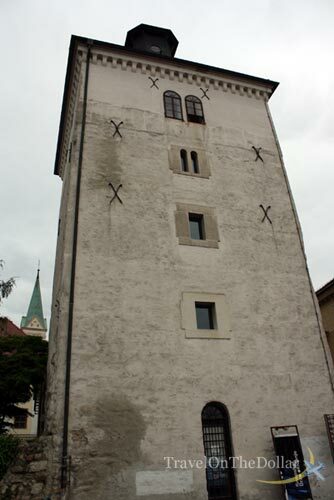 One of the events you don’t want to miss is the cannon shot fired exactly at noon at the Lotrščak Tower. Since 1877, the Grič cannon has been fired every day at noon commemorating an event from Zagreb’s history. According to legend, a cannon was fired at noon one day at the Turks camped across the Sava River and to demoralize them. 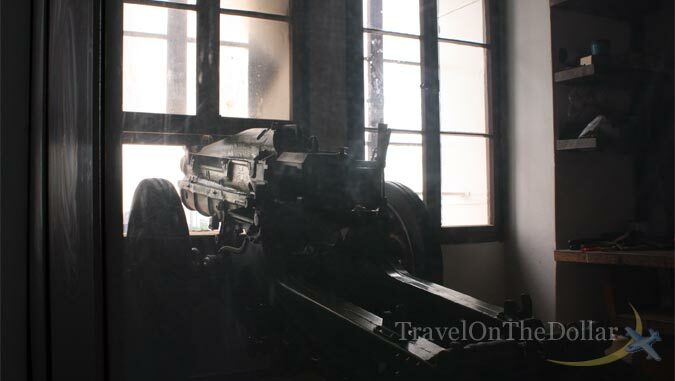 The local explanation is that the cannon shot allows churches to synchronize their clocks. Climb the tower (HRK 10, 11am-8pm Tue-Sun) for an amazing 360-degree view of the city. 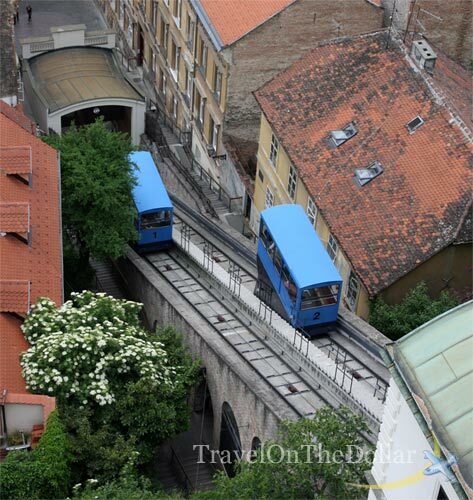 Near the tower is a funicular railway (HRK 10, free with Zagreb Card), which was constructed in 1888 and connects the Lower and Upper Towns. It was easy to reach the main square from the bottom of the funicular station. Keep walking straight until you reach the end of the road and you will reach Illica. Head left on Illica and you will reach the main square in about 5 minutes. 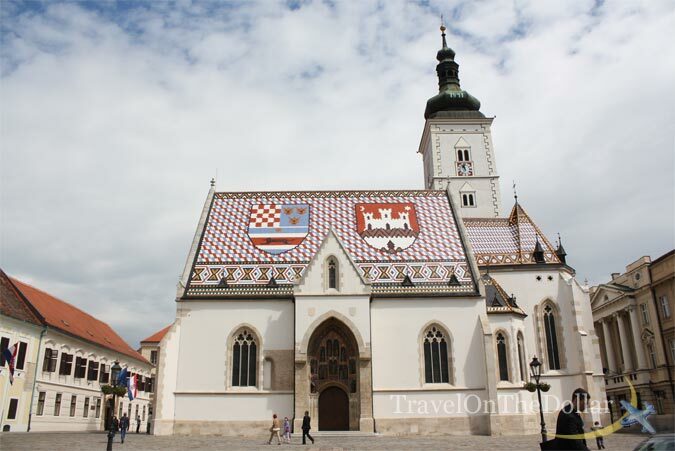 Just north of the Lotrščak Tower, you will see the majestic St. Mark’s Church (Croatian: Crkva Svetog Marka; Hours: 11am-4pm & 5.30-7pm), with its colorful tiled roof depicting the medieval coat of arms of Croatia, Dalmatia and Slavonia on the left, and the emblem of Zagreb on the right. The 13th-century church was named for the annual St Mark’s fair, which was held in Gradec at the time. The Gothic portal composed of 15 figures in shallow niches was sculpted in the 14th century. The present bell tower replaces an earlier one that was destroyed by an earthquake in 1502. The interior contains sculptures by Meštrović. On the left side of this church is Banski Dvori – the Presidential Palace and on the right is Sabor – Croatian Parliament building. 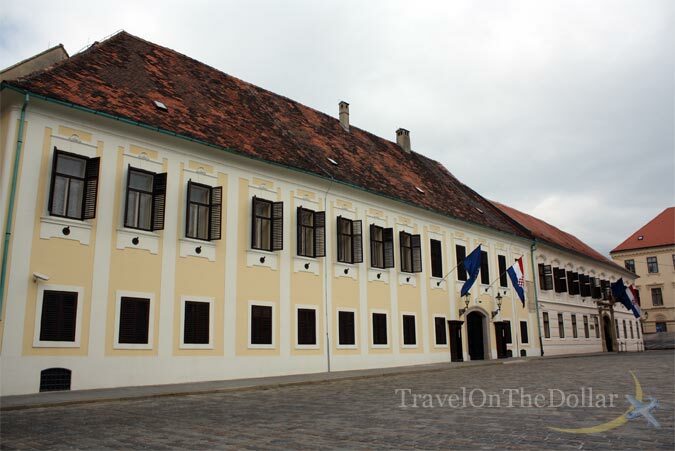 The Banski Dvori (Ban’s Palace) was once the seat of Croatian viceroys and is now the presidential palace. The building is composed of two mansions, houses courts, archives and other government offices. The palace was bombed in 1991 by the federal army, allegedly citing an assassination attempt on President Franjo Tuđman. From April to September there is a guard-changing ceremony every Friday, Saturday and Sunday at noon. Leave Markov Trg by Ćirilometodska to see a sculpted stone head representing Matija Gubec, the leader of a celebrated peasant rebellion who was allegedly beheaded on the square. 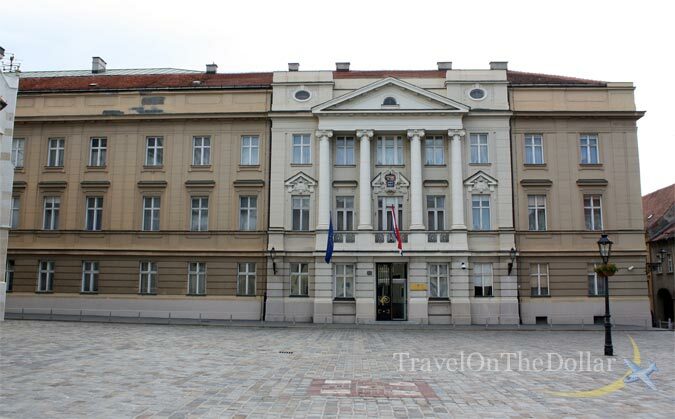 Please visit this link – Zagreb Sights – for more on the sights of Zagreb included in the Zagreb Walking Tour guide. By the time we were done it was about 1pm and some hearty lunch at Cafe Kerempuh, a few steps above and overlooking Dolac Market. After an hour’s lunch, we decided to take the tram and go on a ‘city tour’. We hopped on to Tram #6 which goes to East Zagreb and back to the main square. After a pleasant two hour ride on the tram, we went back to Ivana Tkalčića for some Bijela Kava and rest our legs from all the walking around town. Spending time at the cafe and people watching was relaxing and it was time to head back to the main square and take right on the main street Illica, lined with shopping stores. A ‘long’ walk on Illica gives you a perspective on how this country has come up to EU standards in just twenty years after a long war to independence. Major brands across the world has their stores lined up on this street busy with trams and cars driven on tram tracks. All the walking and back took us to Ivana Tkalčića for some dinner. Returning back to our apartment, we called it a night. Mailing Postcards HRK 28 or $5.50 All postcards mailed to U.S.